The increase in activity is around a site known as Sanumdong, where North Korea assembled most of its ballistic missiles and rockets. It comes after reports earlier this week that North Korea’s main rocket launch site at Sohae had been rebuilt. Work to dismantle Sohae began last year but stopped as US talks stalled. On Friday US President Donald Trump said he would be disappointed if North Korea was to resume weapons testing. “I would be surprised in a negative way if he did anything that was not per our understanding. But we’ll see what happens,” he said. Analysts believe that it is more likely at this stage that Pyongyang is preparing to launch a satellite rather than test a missile. However the US said earlier this week that this would still be inconsistent with the commitments North Korean leader Kim Jong-un has made to President Trump. What is happening at Sanumdong? Large vehicles have been seen moving around Sanumdong, activity which has in the past indicated that North Korea was at least preparing to move some kind of missile or rocket to a launch area. The satellite images were published by the US public radio network NPR. 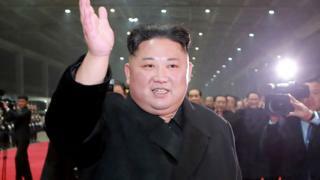 The BBC’s Seoul correspondent Laura Bicker says that North Korea might be testing the US after talks in Hanoi between Donald Trump and Kim Jong-un broke down, hoping that the US will offer a better deal to avoid a launch. Our correspondent adds that experts say the rockets used to launch satellites are usually unsuitable for use as long-range missiles. A much anticipated meeting between the two leaders in the Vietnamese capital last week ended without a deal over differences in how much North Korea was willing to limit its nuclear programme before it was granted some sanction relief. What about the Sohae site? The Sohae launch facility at the Tongchang-ri site has been used for satellite launches and engine testing but never for ballistic missile launches. This week’s satellite images, coming from several US think tanks and testimony from the South Korean intelligence service, appear to show rapid progress has been made in rebuilding structures on the rocket launch pad. US National Security Adviser John Bolton has said North Korea could yet face more sanctions if there is no progress on denuclearisation. A historic first meeting between Mr Trump and Mr Kim in 2018 in Singapore produced a vaguely worded agreement on “denuclearisation” but little progress.